Been a minute since I put a pen to a pad or thumb to a notepad, but anyway I needed to come here. A Facebook status wasn’t enough or a live video where I could get easily distracted. I’ll start from the beginning. I’ve been a janitor at McNair School of Excellence for 7 years now, basketball coach for 6. When I started coaching basketball I used to always yell at kids for practicing in their school uniforms. Then I realized these kids don’t have “extra” gym clothes. 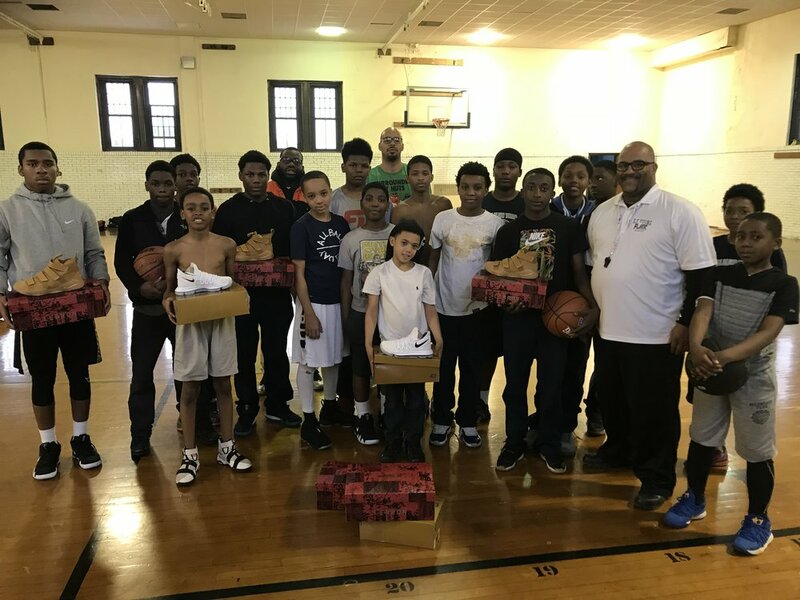 There are not several pairs of basketball shorts at home, there are not any “play shoes.” So for the first couple of years I gave kids my shoes who could fit them and needed them. I purchased shorts and bags for kids who were in need. This got expensive so I came up with a plan. If I could get 20 of my friends to donate $50 I could purchase shoes and shorts for the boys. This plan worked out perfectly! I raised a little of $1000 and was able to get the boys gear. This small gesture which seemed minor to me touched the hearts of many and eventually landed me a spot on WGN! 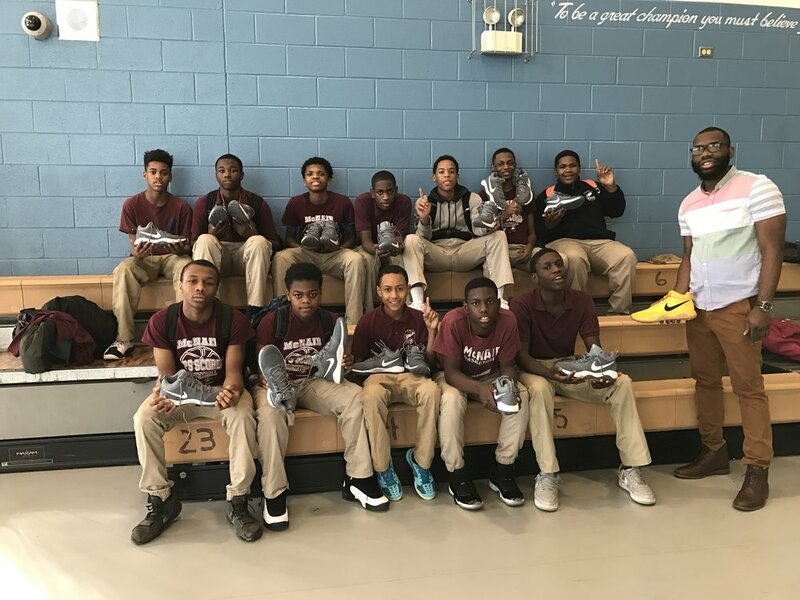 (http://wgntv.com/2016/01/27/teacher-buys-new-shoes-for-basketball-team/) I used the same model again in 2016. With the program running so good I came up with another great idea for 2017! I was starting a mentoring/tutoring program at my school, “Dear Austin” but was thinking about expanding the program to other schools in the Austin area. If I could raise money so easy for my school why not do it for 5 schools?! So I came up with “100 people, 50 dollars, 5 schools.” I came up short, I raised just under $3000 but I took care of three schools! My school, Howe School of Excellence, and Ella Flagg Young. Considered rival schools in our area I still wanted to spread love, because I feel this shoe drive is something small apart of a bigger plan to bring the community together. If we can have 50 young men come together imagine the possibilities. People always tell me I dream too big, but I don’t think this is hard. I think I should be aiming for 10 schools next year!! Thanks for listening to me I know you heard my voice while reading! P.S. if you would like to donate please feel free to click the link below to make a small donation. If you would rather help out than give monetary gifts that is welcomed as well. Thanks in advance. Fresh recaps Insecure Season 2, Epsiode 7: Hella Disrespectful. Fresh recaps Insecure Season 2, Episode 6: Hella Blows. Fresh recaps Insecure, Season 2, Episode 5: Hella Shook. Fresh recaps Insecure Season 2, Episode 4: Hella L.A.
Fresh recaps Insecure Season 2, Episode 3: Hella Open. Fresh recaps Insecure Season 2, Episode 2: Hella Questions. The NBA Finals is has started and it will be the best of times and the worst of times. Unfortunately these 5 fans will piss us off during the finals. These are the 5 fans we wish we could avoid, but can't. Dion talks about how a Summertime Chicago experience at Rainbow Beach made the 95 Air Max Uptempos one of his favorite shoes. While everybody is being PC on the Romphim, we spoke the the truth. Naamonde Williams just published her first book of poetry: Thoughts Along the Journey. : Poems of Discovery. In this edition of Letters Week, she provides a letter to her father with a complex theme of escape. Escape is never cut and dry, it is often necessary and a cause a pain at the same time. Naamonde's letter takes us on such a journey. Veronica Thomas of Besties and Brunch delivers one of the most powerful pieces of the Letters Week series. A vivid letter with honest reflections on love, heartbreak, and relationships. But is it ever as simple as Boy Meets Girl? Letters Week continues with our from former guest Leslie Compton as she writes a letter to her coming of age daughter, Deja, as she starts high school. The bond between mother/daughter is often overlooked in a world of where mama's boys and daddy's girls are prevalent. Here Lez pens a heartfelt letter to let Deja know how much she has added to her life and why she will always be her life saver. If you've ever heard Shannon Martin talk, you'd know she was gifted with the pen. Her thoughts process is on another wave and so is her writing. She constantly lives in the margin of life, that few are built to survive, yet alone thrive as she has. She personifies the blend of fighter and lover and everyone she communicates with is left with a lifted spirit. For this letter, I asked Shannon to write a letter to the man she will spend the rest of her life with and she delivered some awe inspiring truth. I asked everyone for something different for Letter's Week. I knew that Fresh is a man of his community and one of his passions is to impact the youth. One of the embattled neighborhoods of Chicago is Austin, here Fresh pens a letter to the place he leaves a positive impact in daily. I've known Ant P most of my life at this point, 21 years, and if you've known him half as long you know he's great and genuine. I wrote some long drawn out caption, but I deleted that because his words are best here. This letter presents Anthony Peterson in probably his most honest moment, writing a letter to the newly commenced version of himself. For this edition of Letter’s Week, I asked Bradley Walker aka Mr. Write to write about love. More specifically, “love” with a woman who you felt you could spend forever with and for some reason or another it did not work that way. The reason I asked is because love is often masked in male ego and foreign love languages. Love & men is a misunderstood dichotomy, we love hard and often carry it with us for lifetimes. Ask a man about a woman he once loved or still loves, and he can often weave you a tale so vivid that he can put your favorite movie to shame. You just have to peel back the layers. In this letter, Bradley peeled back some of his layers.